You are about to learn about the CB Passive Income program. Today you will get the CB passive income review in its full detail. Continue reading below to find out the truth. Price: $37 per month. $97 one time. Lots of up-sells. What is CB Passive Income 3.0? CB Passive Income is a marketing “secret” system that promises to make anyone earn money, using an email list. Patrick Chan is the creator and he teaches the process of building out an email list by sending a lot of traffic to your squeeze page from one of his web pages that he and his team created. There are a lot of flashy and exaggerated claims on the sales page which is used to entice the potential buyer. You will also find some limited training material that can teach you how to build a list for email, which you can find easily on websites such as Vimeo or Youtube. 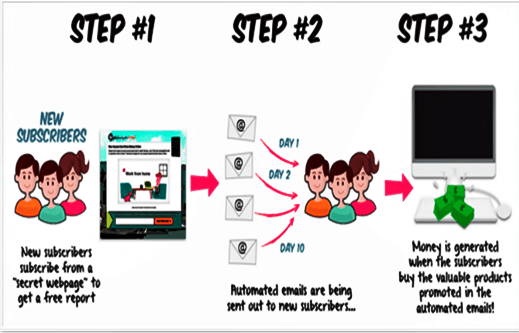 The main idea that CB Passive Income sells is how you can generate quick and easy traffic that is sent to a squeeze page and then that will be used to build a money generating email list. When this process is done, ClickBank (the world’s largest digital affiliate marketing company) products are sent to the owner of the list, then when the sale is made, a commission will be generated by you. The CB Passive income system will automatically send out a blast of emails with your affiliate links supposedly embedded in the code. You are assured that all you have to do is just sit back and see the earnings rolling into your account. It is quite unbelievable to know that the only thing that you seem to have to do is to give away a free report. I have been on the product page and it seems to me to be quite misleading, to say the least. You get an impression that you will not have to do any work at all; in the world of internet marketing when something sounds too good to be true, it usually is. This system is a so-called “Push Button” system which is always a failure, it promises a click of a button riches and it turns out that you get a sour feeling in your stomach. That means that when anyone advertises Patric Chan’s product, it is a clear indication that the product is just a time waster. When it comes to marketing, an email list is an excellent source of making money, and it takes a lot of patience and time. You will have to build a relationship based on trust with your email list. When you do this, they will be your customers for life. However, a lot of newbies make the popular mistake which is to fall for a glittering dream promise and end up losing tons of money to schemes that just do not work. Do you think all that you read above is TRUE? Think again. CB Passive Income is for people who want to make fast money online without putting in any hard work, and that just does not work period. The problem is it doesn’t teach you how to build a business that will last for years, generating money over and over again. When going in any business, it is important that you know how it works, and CB passive income does not fully offer that. And you will not know how an online business really operates. I would not recommend any newbies to try out this system because anyone who is new to online business should know the basics and should only join a course which teaches you how to build a successful online business from the surface. Even experienced marketers with years of experience still find the CB Passive Income a bit difficult to get a hang of. As an online marketer, I only choose systems that have been proven to work for individuals over and over again, and have been around for years. What’s Included In CB Passive Income? Tips on how to build higher quality email lists. One of the problem that I found with the CB system is that its not based on a solid platform. Does the image portray a real authentic business or does it shout out loudly “MAKE FAST MONEY”? 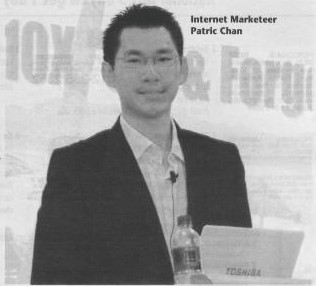 I chose to write about Patric Chan’s program because if it was what it claims to be, everybody would be successful online without doing any work. Working online is a business and anywhere you see a system where it promises you that you will make money by the click of a button (push button system) you should RUN FOR THE HILLS FAST! It is no wonder why so many people continue to get scammed online; because they just want to believe in a false hope that they can become rich without putting in any effort and dedication. I am not saying that CB passive income is a total garbage, because it is not. A few people have managed to make a few thousand dollars with the program, but the majority of people make absolu tely $0. 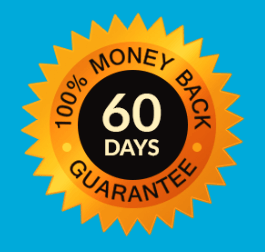 The good thing about this program is that you have a 60-day money back guarantee since it a Clickbank product. Clickbank is the retailer of this product, and they have a reputation to keep in the marketplace, so you will be refunded if things do not turn out the way that you expected it to. So the conclusion of the CB passive income is that it is a program that provides you with a website and gets traffic to your website. When people subscribe submitting their email address, Patric Chan and his team will send out a blast email to them promoting different products. Some people will buy some of the products and many people will not. I get spam email every day, but my Gmail usually gets rid of them. They are a pain to deal with at times and I am sure that most of the people who will be getting these emails will feel the same way. There will always be gullible people out there who will purchase products like these, and I can’t stop them. So CB Passive income is not a great model to follow toward financial freedom. It is likely that you will make no money than make money because many people are not willing to purchase products through email from advertisers that they do not know and trust. Do you have any questions, comments are any other concern? Scheme? Maybe people need some proof. Don’t review a program, if you didin’t bought it! I use the program myself and I don’t like reviews without proper proof. Any program works as long as you follow the steps correctly and patient. I know you are promoting the CB Passive Income because you get a commission when someone purchase it through your affiliate link. That does not make the program legitimate. It is a shame to know that people promote programs just so that they can make money and the person who buys will lose money. In my opinion that is unethical. You should give more use value than dollar value when you conduct business. Thanks for this thorough post Jason. It’s amazing how many people are pulled into schemes like this. We hear so many stories of how it can be done and I and friends in the past have embarked on similar schemes. Keep up the good work. People are pulled into these online schemes because they want to make a change in their lives financially. Unfortunately, many fall victims to scams. Some on the other hand, do find legitimate opportunities. They just need to get the right advice from websites like howtostaysafeonthenet.com amongst many others who are really providing a safe experience for them to generate the income that they so desire. Thank you for engaging in this ongoing discussion George. All the best in your ventures. It is with great pleasure that I provide this information for you and others. The mission is to find the best platforms for anyone who is serious about starting an online business and protecting them from possible online scams. Thanks for this great review, in the past I got suckered in to a couple of these over the last 3 yrs but thanks to people like you I found WA and I’m a lifer for sure. Thanks for the great review to help people avoid being scammed. I too have been a victim of the online scams, that is why I made a vow and a website dedicated to help people who may fall victim to spammers like CB Passive Income. I came across CB Passive Income online awhile ago and was thinking about trying it out until I read your review. Thanks for exposing this scam! This program has too many upsells, fail to teach you how to build a website, never mention anything about targeted keywords or go into detail about creating a squeeze page. Lastly, failing to assist users with getting their content ranked in search engines is a recipe for failure. Based on your outstanding review, I will have to pass on this one and warn others. For everyone that is serious about starting an online business, I highly recommend they try Wealthy Affiliate. It is free to try and if they do not like, they can cancel at anytime with no hassles. Thanks for sharing! Seems like my review came just in time for you to make a final decision on the product. I only look for the best and most legitimate opportunities to make money online so that the people using the programs are rewarded for the time that they spend online. Here at howtostaysafeonthenet.com, we are passionate about rooting out the ruthless scams online. Glad I saved you the trouble Tony, and thank you for clicking through on my site. CB Passive Income 3.0 certainly does look like a questionable business model. All sounds too easy from what you describe. Here at How To Stay Safe On The Net, our main job is to protect internet users from the many programs out there that does not do as they promise, but instead are just there to lead people in the wrong direction. I am happy that you have found some value in this post.